Greenland is covered with a massive ice sheet while Alaska, Canada, Scandinavia, and Russia are not. Why is there no formation of a permanent ice sheet on the inhospitable cold land climate of Canada or Russia? There is even a warm gulf stream running close to the coast of Greenland, bringing significant amounts of heat from the equator to this cold island. How was it even possible, under these conditions, to form such a gigantic ice sheet on this island? Our new hypothesis and method have the ultimate answer to the intriguing question: Why is Greenland covered in ice? Note: To keep this website in the air and to do our research we need your support. Thank you! Fig. 1: Greenland is covered with a massive ice sheet while Alaska, Canada, and Russia are not. Why is there no formation of an ice sheet on the land climate of Canada or Russia? There is even a warm gulf stream running close to the coast of Greenland, bringing significant amounts of heat from the equator to this cold island. How was it even possible, under these conditions, to form such a gigantic ice sheet on this island? Why is There an Ice Sheet on Greenland? Greenland holds the official title of being the largest island in the world. Greenland is situated east of Canada, between the Arctic and Atlantic oceans. About 80% of the island is covered with the Great Greenland Ice Sheet having an average thickness of 1,667 meters. The sheer size of this ice sheet, if it would melt completely, would cause the global sea level to rise by some 7 meters (23 feet). All coastal areas of the world, including many major cities of the world, all major ports of the world, would become flooded. Drill samples have shown that the Greenland ice sheet is approximately 110,000 years old. Other estimates claim that the ice sheet is almost 400,000 years old. How did this ice sheet become so large, while the surrounding countries with mountain ranges, like Alaska, Canada, and Russia, have no ice sheet? Even Iceland is not fully covered in ice. Moreover, the exact age of the ice sheet is unclear. What do we really know? Fig 2: This map gives an indication how the world’s shores would be affected if all of Greenland’s ice would melt. About 50% of the population lives and works in the affected areas. The effects would be devastating. Why is it Called Greenland? Being completely white, it is unsure where the name Greenland comes from – it is said the island got its name from early Norwegian settlers. According to the Icelandic sagas, Erik the Red named it Greenland to lure more settlers in search of land and the promise of a better life. Maybe it was also a sort of incantation to make the cold island more livable. The fact is that history is full of unverifiable stories. The question is: is it correct? Sages and legends often contain parts of some truth. The current scientific view is that Greenland was green some 450,000 years ago. It seems more likely that the name “Greenland” was derived from this original state following a long route of legends and sagas. After all, Homo sapiens roams the planet already more than 400,000 years. What are the reasons for Greenland to be now covered with a very thick icecap? Why is Only Greenland Covered in Ice? Greenland’s ice sheet has puzzled scientists for many decades, and all those debates have led to wild and unscientific theories. Geoscientists, who are in search of the origin of this ice sheet, are often limited by their own paradigm. This limitation sometimes leads to strange conclusions. There have been many reports in the media about the effects of global warming on the Greenland ice sheet, but there is still great uncertainty as to why there is an ice sheet on Greenland at all. There are mathematical models that deal with the Greenland ice sheet, but those models end up covering other continents with ice as well. There is no existing model that covers only Greenland without making radical shifts in the current geological paradigm. What happened back in Earth’s history? Officially, the reason for the origin of the Greenland ice sheet is the interaction of three tectonic processes. First, Greenland had to be lifted, such that the mountain peaks reached into sufficiently cold altitudes of the atmosphere. Second, Greenland needed to move sufficiently far northward, which led to reduced solar irradiation in winter. Third, a shift of the Earth axis caused Greenland to move even further northward. natural changes in atmospheric greenhouse gas concentrations. The University of Bristol, funded by the British Antarctic Survey, claims that none of the postulated theories can account for the thick ice sheet of Greenland. Even the Milankovitch cycles are not at all strong enough to explain the ice coverage of Greenland. 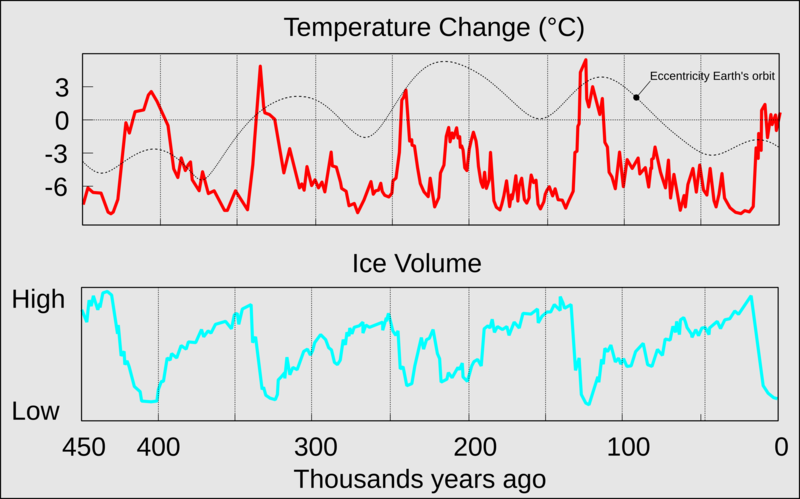 The results of the computations suggest that climatic shifts associated with changes in ocean circulation and tectonic uplift did affect the amount of ice cover and that the ice waxed and waned with changes in the Earth’s orbit. None of these changes were large enough to contribute significantly to the long-term growth and continued existence of the Greenland ice sheet. The conclusion of the University of Bristol further suggests that the huge ice cap could only grow when Greenland was “roofed” with a giant bubble of low CO2 levels covering the whole island. How was all the vaporized seawater transported to Greenland without interfering with the CO2 bubble? How did that bubble get there? Which mechanism kept it in place for many hundreds of thousands of years? Not a very scientific approach, is it? In other words: none of the current theories appear to be valid. The proposed necessity of high mountains for the formation of an ice sheet is not a logical starting point in any case. The ice sheet around the Greenland Summit, which is situated roughly in the middle of the sheet, is about 3,000 meters thick. The altitude is also about 3,000 meters. The mountains must have been pushed down – but by how much? At which point are they trading places, or was it a slow sliding rate? High altitudes mean low air pressure, thus lower transportability of water. If that were the main driver, why are there no massive ice sheets on the Brooks Mountain Range, the Innuitian Mountains, the Mackenzie Mountains, the Ural Mountains, the Central Siberian Plateau, the Kolyma range, the Chersky range, the Koryak range, and the Verkhoyansk range? All these mountain ranges are well within the 3,500 km radius as presented in Fig. 3. None of them have ice sheets like that of Greenland. Not even close. Why not? After all, the land climate of Siberia would greatly facilitate the formation of a huge ice sheet on these mountain ranges. Scientists can probably think of very complex explanations for this, but they often neglect Occam’s Razor – the simplest explanation with the least assumptions is always the best theory. 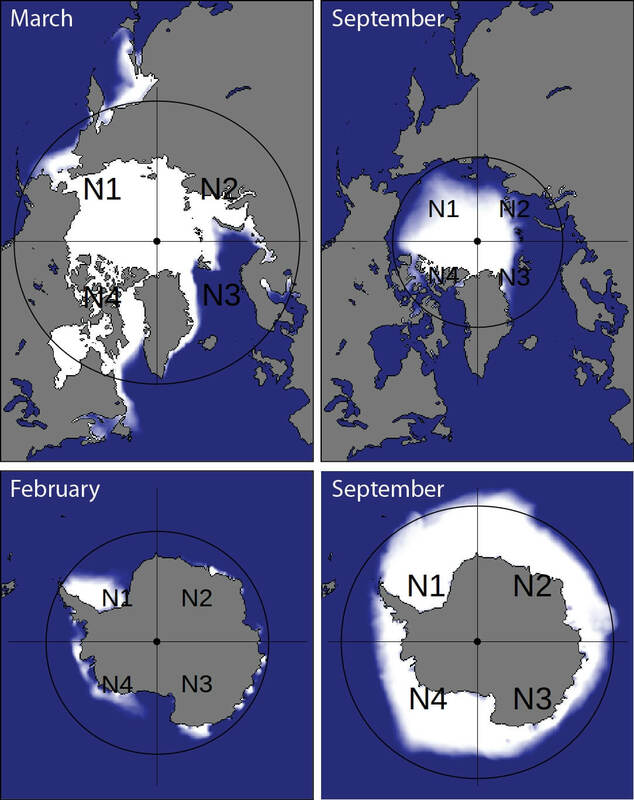 Why no Ice Sheets on Alaska, Canada, or Russia? The latest official theory why Greenland is covered with ice assumes that Greenland was covered with high mountains. These high mountains were supposedly formed by tectonic forces that pointed towards the location of Greenland. The relatively thin crust was deemed to be easier foldable which was then thought to make the formation of mountains easier. The mountain peaks were thought to start accumulating an ice sheet after Greenland shifted 18° farther up North to its current location, all this according to their new theory. At the same time, according to these geologists, the geographic North pole remained perfectly stationary at its current location. How does this kind of science work? In fact do they suggest a similar mechanism as Charles Hapgood – Earth Crust Displacements. But they, of course, avoid that word. Why would only Greenland shift Northward? And the rest stayed in place? Seriously? Why did this accumulation of ice not happen in similar regions of Alaska, Canada, or Russia, where the much colder land climate has an even better chance to build up an ice sheet? Strangely, this is never mentioned in their theories. Are Earth Crust Shifts Possible? The late Professor Hapgood first coined the idea of Earth Crust Displacements in 1958 and he even published detailed books and elaborate theories on this issue. Hapgood also explained how crustal shifts were activated, namely that the accumulation of ice around the poles caused eccentricities. Then, he claims, these eccentricities trigger centrifugal forces on the crust and that could lead to shifts. We consider his view as somewhat inconsistent and not completely in line with what we see happening today with Antarctica. The centrifugal forces caused by the ice sheet on Antarctica today are about 2 times larger than the Northern forces during the last ice age. We would be shifting as we speak. The fact is that crustal shifts are the only possibility to cover Greenland with an ice sheet and that we are now looking at the remains of crustal shifts or deformations. Why Were the Glaciation Sheets Centered Around Greenland and Not Around the Spin Axis? Ice has the natural tendency to grow and to melt concentrically around the poles. This tendency is not influenced by any wobble or tilt because these do not cause an eccentric path around the spin axis of the Earth. Yes, wobble and tilt might cause a larger area to be excluded from Sunlight, but no, they are not the cause of an eccentrically-located ice sheet. If scientists think so, they simply lack enough insight. The eccentricity of ice formation around the North pole is caused by deformations of the crust, which causes large bodies of ice to be transported to locations where they were not “created”. The ice sheet on Greenland should not be there if the geographical pole always had been where it is today. There is simply no scientific explanation possible without the introduction of a radical shifting mechanism of the Earth’s crust. Thinking out of the box and understanding why the ice sheet was formed on Greenland helps us project a possible response of the ice sheet to future climate changes. It also helps us understand why there is so much controversy around the CO2 debate. It is simple if you do not agree that CO2 is the cause of climate change. But with what other mechanism are you replacing this ice sheet phenomenon? Milankovitch cycles? Earth is a sphere, hence are these cycles not sufficient enough to cause significant climatic changes? At the end of the winter, the North pole map shows a large amount of sea ice, which is almost concentrically formed around the geographical pole. During winter, the sea ice in the Arctic ocean gets trapped between Canada, Russia, and Greenland (N1), and forms a dense pack of sea ice. This pack of ice cannot go anywhere, while the ice between Greenland and Norway floats into the Greenland Sea and the Norwegian Sea, and finally melts. The Gulf Stream plays a major role in this process. This is the reason why at the North pole the ice is not as symmetrically accumulated as at the South pole. When we look at Antarctica, we see that the sea ice around Antarctica can freely float away into the Southern part of the oceans and is almost symmetrically formed around the geographical South pole. The slight acentric accumulation of ice on the South pole is caused by the predominant ice mass in the sectors S2 and S3, which is a major chilling factor in the formation of local sea ice. 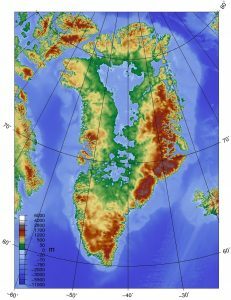 Was the Former North Pole on Greenland? The center point of the last ice age was on Greenland. 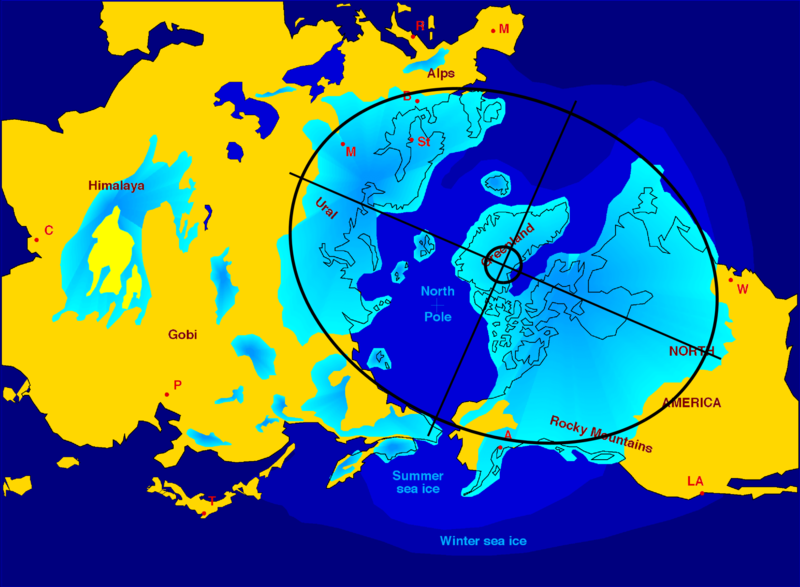 Greenland was located at the North pole due to crustal deformations. That is the reason why only Greenland is still covered in ice. The ice sheet on Greenland is melting because it has shifted from its former polar position to its current position, about 1,500 km South. The ice sheet melts so slowly because Greenland still lies predominantly within the polar circle. The outer edges of the sheet are melting much faster than the elevated center near Summit Station, located at the peak of the Greenland ice cap. The overall balance is negative – the ice is melting. The only sure conclusion we can draw is that ice always forms symmetrically around the pole unless there is a reason, a strong mechanism that renders the ice formation asymmetric. Which terrestrial mechanism could have been strong enough to cause such an asymmetry during the last ice age? There is none; the Bering Strait is far too narrow for a warm current to pass through and cause a massive eccentricity of the Laurentide ice sheet, the Innuition ice sheet, the Greenland ice sheet, and the Scandinavian ice sheet. 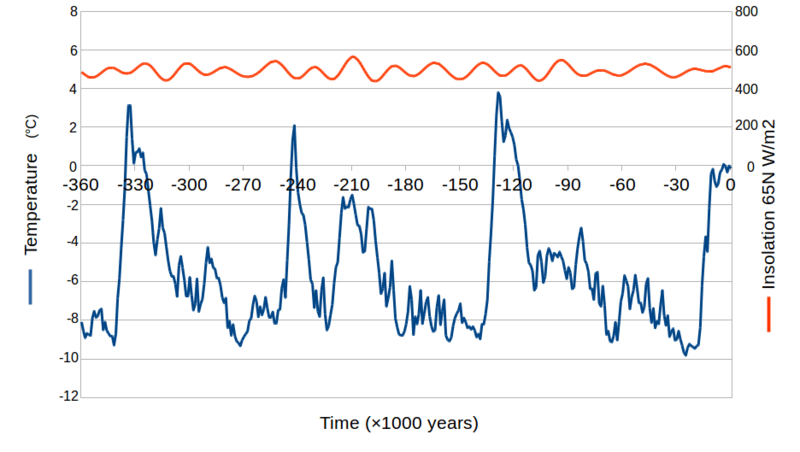 Fig 7: There is not a single relation between the Solar Insolation and the onset and end of glaciation cycles. There is also not a single relation between major temperature drops and Solar Insolation. The fluctuations are MUCH too weak to cause such wild reactions, but geologists still believe this without making any proper analysis or calculations. Only eccentricity relates very closely to temperature changes, and here lie our ultimate keys to meaningful answers. | © 2015-2018 by Mario Buildreps. Greenland was situated at the (geo) North Pole between 130,000 and 270,000 years ago and we can even point to the exact location. The region of Greenland is in a direct line with the orientation clusters of over 230 ancient pyramids and temples that are located all around the world. Surely, this is no coincidence. There is only 1 in 5.77×1020 chance that an arrangement of this magnitude happens accidentally, and we know that this is confirmation of something very significant. At that time, our ancestors oriented their structures to a geographic pole that was situated at another location: Greenland. This completely new theory explains in the simplest possible way why there is still a thick ice sheet on Greenland. This also explains why there is even an ice sheet present, while there is no ice sheet left on Russia or Canada. The ice sheet gets thicker the closer we get to the pole. That is what we see on Antarctica today. The current North pole and the former North pole have shifted at an angle of about 14° in latitudinal direction, but the shift did not take place overnight. Fig 8: The current location of Greenland makes the ice sheet melt at a very low rate. 99.9% of the melting energy is provided by the Warm Gulf stream. In about 4,000 years from now, the ice sheet will have completely melted. In 2100, global sea levels will have risen about 10 cm (4 inches) due to the Greenland melt alone. The estimated melting rates of the IPCC are greatly exaggerated. There is not enough energy to change ice into water, called heat of fusion. Unless the ice sheets start to fall off nothing spectacular will happen there in our lifetime. But when you come back in four thousand years you would see that our coastal areas have changed radically. | © 2015-2018 by Mario Buildreps. The ice sheet will of course wax and wane a little from year to year, from decade to decade, or even from century to century. That’s because Greenland has moved to a part of the Arctic where the temperature hovers around the freezing point. But the overall picture is clear. It melts substantially when measured over a period of a thousand years. Airflow accounts for less than 0.1% of the melting energy, and from the warm Gulf Stream for 99.9%. The Gulf Stream is naturally present around Greenland to restore the thermal balance after the balance-disturbing crustal shift that took place between 130,000 and 26,000 years ago. The crust shifted an average of about 15 meters per year over a period of 104,000 years in the latitudinal direction. Therefore, the ice sheet melts from below, and hardly from above. This melting mechanism has absolutely nothing to do with a greenhouse effect. The melting process is fueled by the balance-restoring El Niño. The temperatures of the elevated center part of Greenland is always far below zero, while the lower outer edges of Greenland are nearly half of the time far above zero. It is not easy to model this process, even with the understanding that the origin of the present Greenland ice sheet was a former North pole. If you would zoom in on the “Greenland Ice Sheet Melting Rate” graph above, representing a period of roughly 20,000 years, you will find an erratic pattern. Climate skeptics will try to zoom in on parts of the erratic pattern and claim that the sheet is growing. Obviously, that would be the wrong interpretation of a long, slow process. Fig 9: The sheer weight of the huge ice sheet of Greenland has pushed the land mass of Greenland down, leaving high mountain ranges around it. It created a kind of ‘open shop freezer’. The ice sheet has been trapped inside. It takes therefore much longer to melt. While the former ice sheets of the last glaciation on Russia, Canada and America are long gone, the fact remains that the ice sheet on Greenland is still melting, and that means that the ice sheet on Greenland must have been very thick. The core temperature of the Greenland ice sheet was also much lower because it was situated at the North pole. 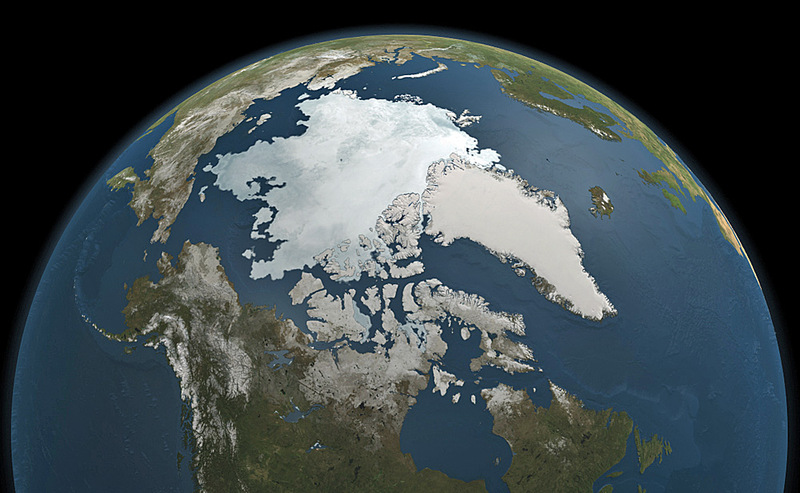 The other ice sheets on Canada and Russia were not as cold as the one on Greenland. The immense thickness and the very low temperature of the Greenland ice sheet, combined with its current polar location (it is still cold), makes it melt at a very low rate. Zero Carbon emission or much Carbon emission – no matter what we do or don’t do – this Greenland ice sheet will melt anyway. No scientist has ever proved that CO2 can cause a global temperature change of between 10 to 15°C. Yes, CO2 is indeed a greenhouse gas, but it is a very weak one, and yet, it has been made responsible for something it is incapable of doing. CO2 is an effect, not the cause. CO2 lags behind because it is released by warming oceans and absorbed by cooling oceans, and this is why it lags behind on global temperatures changes. Calculations, resulting in the graph above, show that the original ice sheet was 32% thicker when it was situated at the North Pole, an average around 2,200 meters thick. The thickest part of the ice sheet was centered around the pole itself and was between 4,000 and 4,500 meters thick. The estimation of the IPCC concerning the current melting speed of the Greenland ice sheet is in line with the calculations based upon a shifting crust (the latest shift) which took place between 130,000 and 26,000 years ago. The only difference is that the origin of the ice sheet of Greenland has been determined, and that makes a world of a difference. The extrapolations of the IPCC concerning the melting rate are exaggerated and based on too many unscientific assumptions. 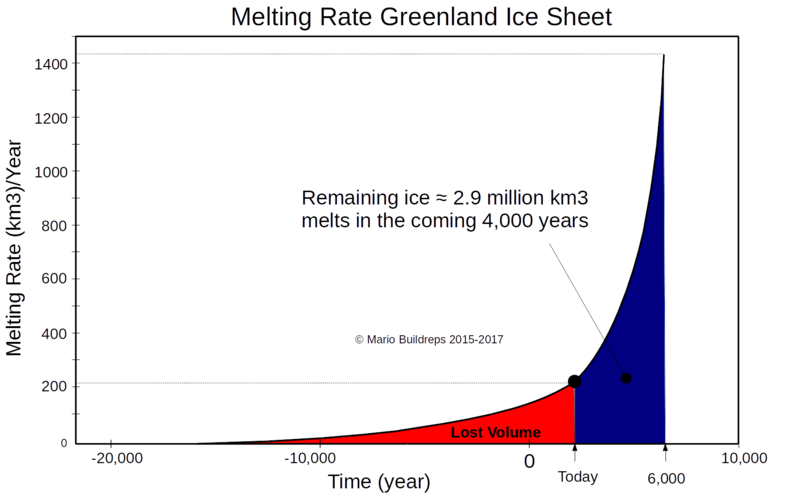 The ice sheet will not melt within just a few hundred years. There is simply not enough energy to change ice into water, called heat of fusion, within this short time frame. When all ice on Greenland has melted into the oceans in about 4,000 years, it will dramatically influence the climate on earth. 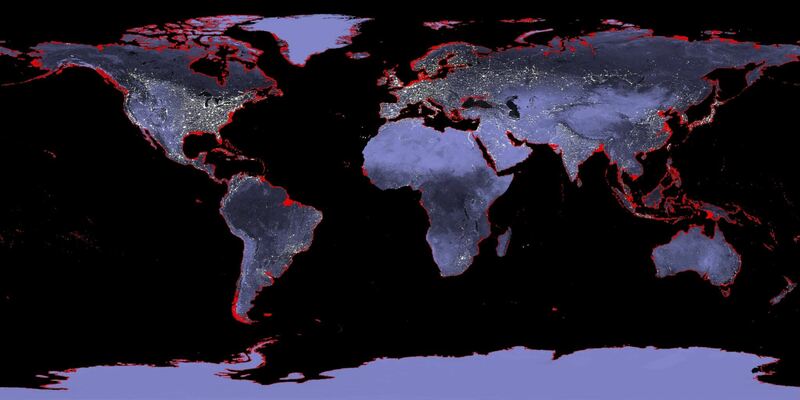 The rising sea level will affect all coastlines. The energy that was required to melt the ice sheet cannot go anywhere else than into warming the whole atmosphere and the oceans. The Northern hemisphere will heat up, the Southern hemisphere will cool down. This is a logical part of earth’s balancing mechanism, otherwise, it would not have survived billions of years. But how exactly this will work out is yet unknown. Paleomagnetism delivers indirect proof for crustal shift, although paleomagnetists do not recognize it as such. Paleomagnetists assume that, when they look at the samples of alleged magnetic pole reversals, that the magnetic pole was the only variable that changed, however, there is no way to tell from the samples what exactly had changed – the magnetic pole or the crust. Because the magnetic pole obviously moves, it does not mean the other variable, namely the crust, is rigidly fixed. That is an unscientific assumption. It is believed, that there is no evidence for crustal displacements because ever since the discovery of plate tectonics, any notion of crustal displacements other than tectonic ones is dismissed. Our research proves that both moved – and that can be partially determined by using the orientation patterns of ancient structures, that clearly show how the crust was positioned over the last 400,000+ years. Many scientists are not aware that magnetic reversals are, in fact, evidence for Earth Crust shifts. Only because we cannot easily solve two variables from just one equation, the assumption is conveniently made that it was only one variable – magnetic reversals. Our large article on the main page shows the amazing orientation patterns of more than 500 ancient structures that are spread around the world. These 500+ pyramids and structures point to three different, clear polar locations on Greenland, and exactly at the same region that was already centrally embraced by the ice sheets of the last glacial cycle. This does not only show an amazingly precise orienting of pyramids and structures around the world, but it also proves that these pyramids are much older than Academia had always assumed because these ancient pole positions are not just a few thousand years old. We can find the exact location of the Greenland pole by performing spherical triangulations with the orientation of ancient structures around the world. It has similarities with the way sailors used to find their way on the seas – before GPS. Is it Important to Know? Why is it important to know that the former North pole was once on Greenland? Because this notion has a huge impact on the climate models, and even on the current weather models. All models somehow try to explain the presence of the ice sheet on Greenland from its current position, and not from the position where it came from, and that is why it is melting in the first place. If the current climate models have not included the correct starting parameters, they will all be wrong in their long-term predictions. This is why it is important to know that a former North pole was on Greenland. This theme is further expanded in the articles that can be found on our home page. I personally believe, you should receive a Nobel for your exceptional work! The universe is mathematics – so goes our planet! Hi Jim, thank you very much for your kind words. Indeed is our universe mathematics, and by being like this it creates endless shapes and forms of live and endless sorts of experiences. Your support is much appreciated!